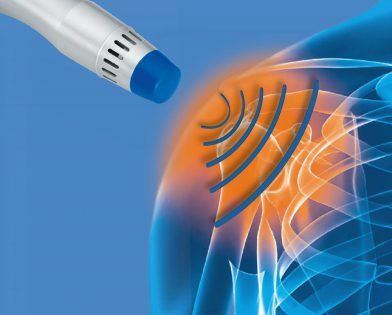 Extracorporeal shockwave therapy is a non-evasive, non-electrical, high energy sound wave that passes through the soft tissue via a hand-held gun-like attachment. The sound wave combines with a pressure wave to create a unique treatment that breaks down scar tissue and boosts circulation and collagen production. This promotes renewed recovery, healthier tissue and more efficient muscles, tendons and ligaments. It is ideal for chronic injuries and stubborn muscle adhesions ('knots'/trigger points). Shockwave therapy is most suitable for chronic ankle sprains, achilles tendinopathy, greater trochanter syndrome and bursitis. It is ideal for rotator cuff tendinopathy, shoulder calcification, plantar fasciitis and tennis elbow, as well as other tendon and ligament disorders. There is also some new research on the use of shockwave for fractures, arthritis and some neurological conditions. Shockwave therapy is used in conjunction with 'usual' Physiotherapy to promote rehabilitation, relieve symptoms and build strength. ESWT lasts between 2-5 minutes and is added into your usual Physiotherapy session. In our experience, 80% of patients report significant reduction of symptoms after three to five sessions. We place ultrasound gel over the areas to be treated before gliding the gun-like attachment across. You will hear a clicking noise and feel a tapping/pinching sensation that can be uncomfortable. We guide the treatment's intensity to your comfort. All of our therapists are trained in administering Shockwave Therapy and are able to determine whether Shockwave Therapy is suitable for you. Please contact us for more information, including prices.